For three years we have been investing in helping customers accelerate their IoT initiatives through Azure IoT Suite. Our goal is to enable customers to get started in IoT quickly, and one of the key ways we have enabled customers to do this is by creating solutions that address specific scenarios and business needs. This includes solutions generally applicable to all industries, like Remote Monitoring and Device Simulation. Others, like Connected Factory and Predictive Maintenance have been specific to industries like manufacturing and aerospace. 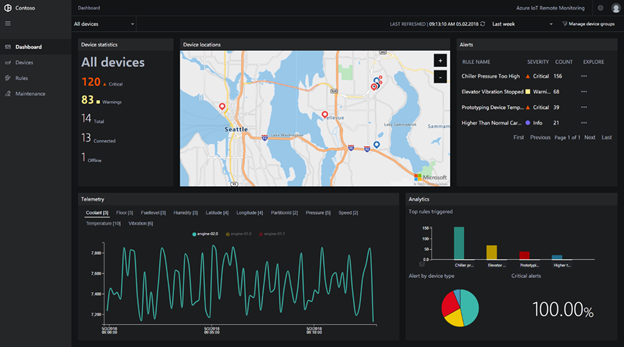 In October, we announced a major update to Azure IoT Remote Monitoring. Our focus on operator scenarios built on a flexible open source architecture represented an evolution in our solutions. Remote Monitoring is aimed at accelerating our customers to production deployments, with lower cost, a redesigned UI, enhanced operator scenarios, and flexibility for customizations. "By using the Azure IoT Remote Monitoring solution, we leverage a production-ready architecture for asset management, data visualization and business application integration. This allows us to manage wellsite digital deployment of products and services to deliver solutions that improve customer performance. ", says Soumya Seetharam, Schlumberger Industrial Internet Center Manager. Today, we are excited to announce the next stage in our evolution of customizable solutions from Azure IoT Suite to Azure IoT solution accelerators. Future investments will be in both horizontal and industry’specific scenarios that customers and partners can customize and take to production faster. Enhanced UI: Operator experiences are even smoother with production-ready controls, and improvements in code clarity allow any developer to customize with ease. Advanced rules and streaming powered by Azure Stream Analytics engine. Live maintenance mode to track your devices telemetry while doing maintenance. Richer out of the box demo experience. Easier device connectivity: see your device details light up in the platform automatically, no need to customize the UI. Better maps: our device tracking is now powered by Azure Maps, the latest technology to provide geospatial context to data. Richer integration options: we have invested in third party integration. We have new tutorials that showcase integration with services such as Power BI, Azure Time Series Insights, Azure Data Lake. We are also excited to announce collaboration with Telefónica to enable better integration with their IoT connectivity platform. Customers using Remote Monitoring and Telefónica’s platform can manage their Sim-powered devices using Remote Monitoring. “We are excited about the integration of Telefónica IoT Connectivity Platform data into Azure IoT Remote Monitoring. This will benefit customers looking for an easy, customizable IoT solution built on Azure and Telefónica IoT Connectivity.” Javier García Puga, Global Head of IoT Technology at Telefónica. In addition to solution accelerators, we are excited to announce an update of the Azure IoT Reference Architecture, a comprehensive guide for developers and architects wanting to understand technological choices behind a cloud solution for the Internet of Things. The guide is divided into several sections. You can read the first section today here; we will be publishing additional ones in the coming weeks. 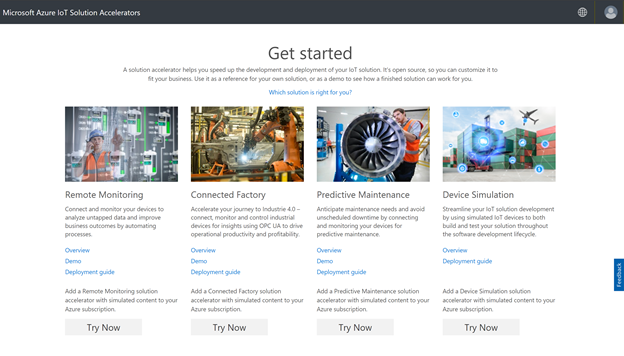 As part of our this evolution, we are introducing a new site: www.azureiotsolutions.com, where customers and partners can learn about all of our solution accelerators and our Azure Certified IoT hardware ecosystem in a curated experience. Provisioning the solution at http://www.azureiotsolutions.com/. Learn more about Azure IoT Remote Monitoring capabilities. Learn more about the Azure IoT Reference Architecture.